More than a billion Chinese around the world are today marking the New Year (also known as Spring Festival) with celebrations that last for the next 15 days and conclude with the Lantern Carnival. The Chinese lunar calendar is based on the zodiac of 12 animals. 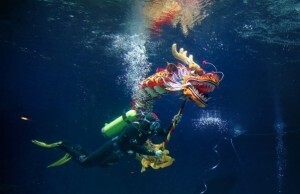 Last year, the Dragon, which is usually associated with prosperity and blessings, ended on February 9. This year, the Water Snake, takes on a more sombre tone with some saying the next 12 months can be as deceptive and cold-blooded as its namesake. Attributes of the Water Snake are that it is elusive, patient, and cunning, waiting for the right time to strike. According to Chinese astrology, timing will be key this year, particularly for those born under this sign. Some say that the year of the Snake is marked by ominous events, pointing to the 9/11 attacks on the US as having occurred in that year. Despite the negative denotation the Snake may receive, the New Year is about Chinese families coming together over dumplings or rice cakes – both believed to be symbols of prosperity, hanging red lanterns and setting off fireworks at midnight. Fireworks are likely to be used for the next 15 days. Some families will also write verses in red scrolls which the affix to their homes to scare away evil-doers. Hundreds of millions of Chinese workers are expected to travel great distances to their families in villages and small cities. According to Chinese media, more than 9 million people left Beijing, ordinarily a city of 20 millions. This year, however, Beijing authorities have adopted a more restrained approach to the celebrations, asking for fewer fireworks to be used to avoid adding to the persistent smog and pollution problem. They have also called on restaurants, halls and even families to minimise food wastage. The Spring Festival is also celebrated in North Korea, Vietnam, Taiwan, and Indonesia. Chinese communities in the US, Canada, the UK and Australia will be holding parades and special concerts to mark the New Year.